Get wrapped up in our mummy cookies - a creative treat which can bring life to any dessert table. 1 Beat sugar, Hellmann's® or Best Foods® Real Mayonnaise, Spread, egg and vanilla in large bowl with electric mixer on medium speed, scraping sides occasionally, 2 minutes or until well blended. Reduce speed to low. Gradually beat in flour just until blended. Wrap dough in plastic wrap and refrigerate 1 hour. 2 Preheat oven to 350°. Lightly spray cookie sheets with nonstick cooking spray; set aside. 3 Roll dough into 36 (1-inch) balls, then form into baby carrot shape for body. Roll remaining dough into (1/2-inch) balls for head and press together with body. Arrange ''mummies'' on prepared baking sheets, 2 inches apart. Bake 15 to 18 minutes or until bottoms are golden. Cool 2 minutes on wire rack; remove cookies from sheets and cool completely. 4 Microwave white chocolate in microwave-safe bowl at HIGH 1 minute; stir until smooth. Dip tops of cookies in white chocolate; arrange on wire rack set over aluminum foil to catch excess chocolate. Make ''bandage marks'' on the body using toothpick. Add morsels for ''eyes''. Cool completely before serving. 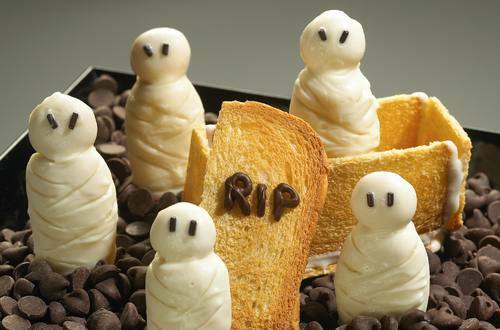 TIP: To make coffin, “glue” long melba toasts together with additional melted white chocolate, cutting the toasts to fit short ends.